This is why the analysts make the big bucks. Predictions. Forecasts. Gazing into crystal balls to come up with . . . This is Apple’s future, according to Forrester analysts J.P. Gownder and James McQuivey [via Wall Street Journal]. Gownder and McQuivey predict that Apple, who brought us the OS X operating system, elegant computer products, the iPod line of digital music players, the iTunes store, and the iPhone in the past eight years, next will come up with products and services that will connect computers to content throughout the digital home by 2013 [Wired]. Forrester thinks that, judging by Apple’s performance under CEO guru Steve Jobs, the company is set for radical change over the next five years. But a wall-mountable digital picture frame — even if it looked like a MacBook Air display? A clock radio that pipes music across a home network? An “AppleSound” universal remote control with a touch-sensitive screen? A media storage something-or-other that’s not a “server” because the word “server” scares the average person? 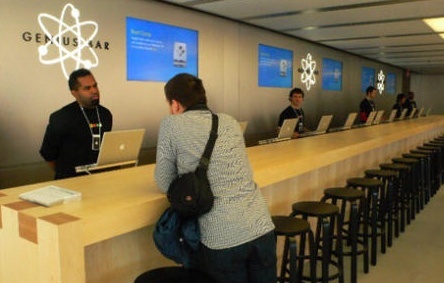 And house-call technical assistance from mobile “Genius Bar” workers? Each one of these products or service already exists. The argument could be made that the mp3 player existed before the iPod, and that would be correct. But what Apple did was not invent a digital music player but an ecosystem of hardware (iPods), software (iTunes), and commerce (the iTunes music store) that wasn’t available holistically before. By developing a platform, Apple changed the music industry and culture forever. It now owns 70 percent of the digital entertainment device market and iTunes is the leading seller of music in the U.S.
A similar argument can be made about the iPhone. Cell phones existed long before the iPhone, but none of them delivered a true Web-browsing experience, a super-easy-to-use interface, and a platform from which to build the future of mobile communications. In less than a year, Apple sells more smart phones than any other manufacturer, including stalwarts Nokia, Microsoft, Samsung, Motorola, Sony Ericsson, and LG. Apple can certainly put its mark on digital picture frames, clock radios, universal remote controls, and the “Geek Squad.” Why not also come out with Apple networked refrigerators, toasters, and toilet paper holders that also play music from your iTunes library? Because these products don’t change games. And Apple is all about changing the game. What we do agree with Forrester about is Apple’s desire to rule the digital home and living room. In our crystal ball, Apple is tying the digital infrastructure together in its usual easy, elegant manner, moving content seamlessly and transparently throughout the home and between devices (Apple’s and others? ), all of which points to the arrival of another ecosystem and platform. Could it be a new kind of TV? A different type of set-top box or digital hub? An unexpected game console hybrid? Or something we don’t see yet?